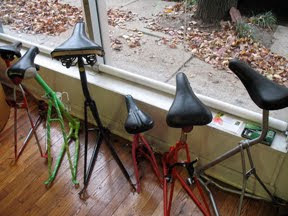 Yeyo Arts Collective: St. Louis Artworks Bicycle Bar Stools! St. Louis Artworks Bicycle Bar Stools! For a limited time Gya will be the home of barstools created by area youth! Come into our location to see the interesting and one of a kind creations. ... where area youth turn artistic dreams into practical reality through our innovative job training and arts education program. By apprenticing under working artists, teens expand their artistic talents, gain job and communication skills and work together to create art for clients and communities. Apprentices working in this discipline designed bicycle racks for: Kakao Chocolate, The Moto Mueseum, and the Schlafly Tap Room. The bike racks, called BoomerRacks, were made from reused bike parts and promote healthy and green lifestyles through both biking and the reuse of discarded materials. Apprentices also made additional products for sale, creatively using recycled bike parts to make functional items such as clocks, coat racks, chandeliers, bar stools, key chains, and jewelry, as well as decorative tire weavings and wall pieces.